The North Face have a decorated history sponsoring elite runners and iconic trail races such as UTMB and The Endurance Series in the States. And yet, they aren’t a brand which are a go to for shoes. But is this about to change? With an athlete roster boasting the likes of Rob Krarr, Dylan Bowman, Rory Bosio and Stephanie Howe, there is a huge pool of knowledge to develop from. Part of the new line of shoes coming from the San Fran based brand is the Ultra Endurance, a well cushioned mile munching machine. Now this was my first time slipping on a pair of North Face shoes for running or hiking, so I was intrigued to feel and see what a brand goliath could produce. Straight away, the cushion was comfy and the overall fit form precise with the laces undone. 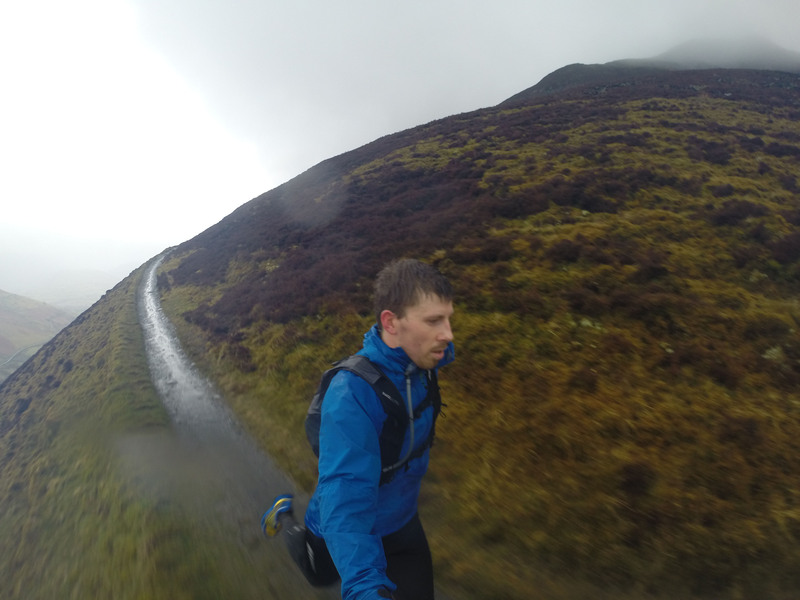 I took the Ultra Endurance on a variety of terrain, from the loamy sands of my local trails, to the mud and rock of the Lake District during the March storms. The heel toe drop of 8mm is just about right. I’m not one to bang on about what is correct for you, we all run differently, have varying gaits and strengths, so really you need to know your own, but for me, this hits the right spot. With 4mm, on longer runs, my foot has become tired as I don’t spend most of my time in minimal stack heights, so 8mm is comfortable, fast and supportive. Of course, what good is a stack height, if the EVA underneath doesn’t work with you. 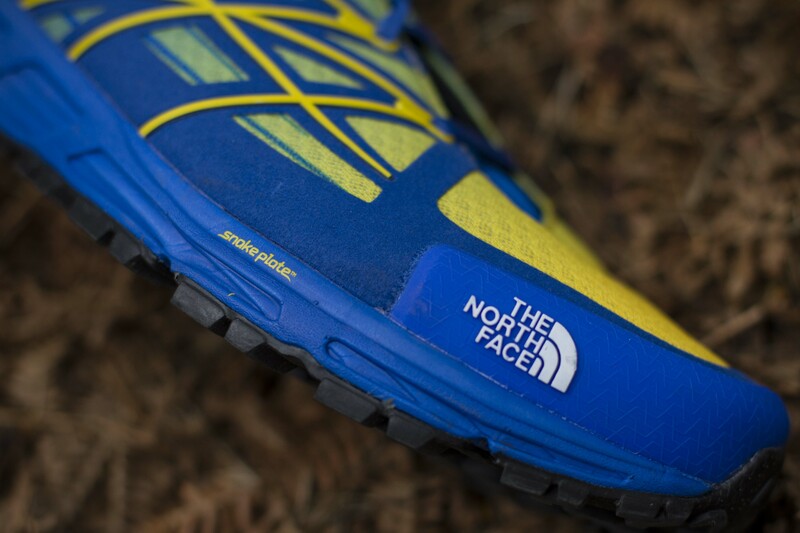 The North Face use a single density, compression molded EVA in their midsole and it works well. It doesn’t feel sloppy, nor does it feel rigid. Given in many ways I could be as brash to say it is simple, in an age of zonal midsole compounds, it achieves what it sets out to. It provides a cushioned ride, doesn’t break down on those 15+ mile runs and is predictable, whether you’re crushing a flat single track or descending a craggy trail. 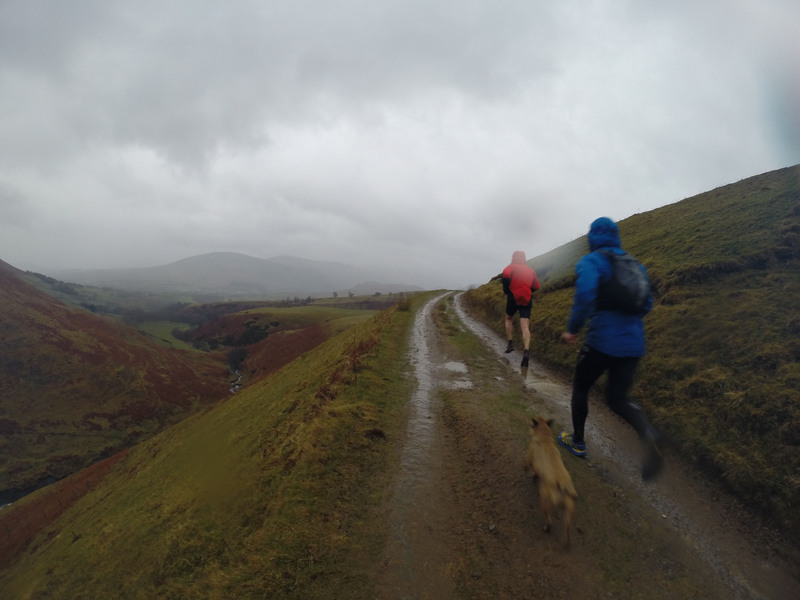 This was particularly apparent in the Lake District on the last weekend of March, when heavy rains left the trails saturated and the Ultra Endurance were completely soaked early on for each run. Despite the conditions, the midsole performed well, allowing me to concentrate on the trail rather than comfort. ESS Snake Plate™ forefoot protection is there to protect when the trail bites back, and I can’t say I noticed it, which probably means it did it jobs. On more technical trails, a rock plate is really worthwhile, for when a small sharp edges decide to poke their way in-between the lugs. On the outsole, The North Face have opted for Vibram® MegaGrip offering, aimed to give the best in a variety of situations and conditions. This is my main gripe for the Ultra Endurance, I was flat on my arse twice on one run. On waterlogged ground, where normally I would expect to grip or slide controllably, the two times I caught a foot on it, I was gone. Now this could be due to the lug length, compound or a combination of the two. The first time, I was taken by complete surprise, my left leg taking out my right and I threw myself into the heather to the left of the trail to avoid a painful fall into the rocks ahead. On the second occasion my foot slid out, causing me to fall forwards, breaking the fall with my hands. These two experiences weren’t isolated, as I managed to catch myself a few more times, before I ran gingerly in frigid conditions on the trail. To add some balance, on my local sandy trails, the Ultra Endurance were awesome, on the road they ate miles as I made my way too and from the trails. But on wet trails with saturated ground, they lacked the ability to control and move predictability when the grip wore thin. Though disappointing, as this wasn’t off trail, the Ultra MT look like they would excel in such conditions due to the lug length and tread layout. 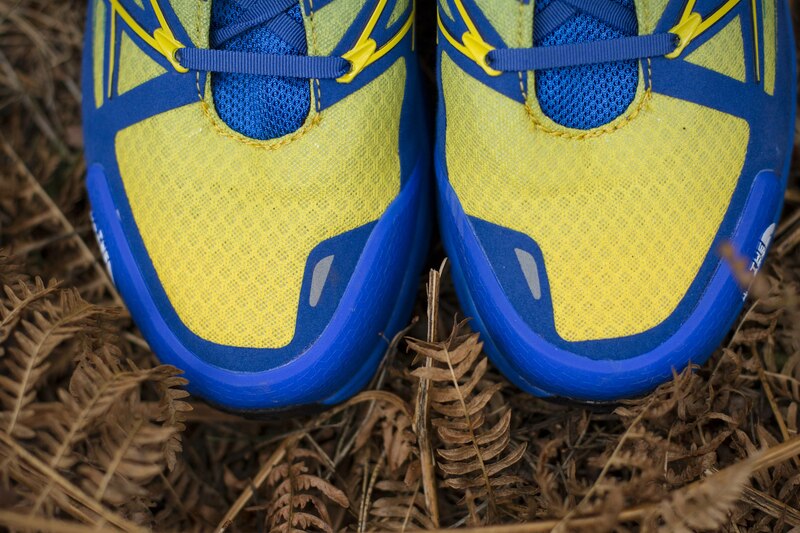 The Megagrip outsole wears well and the durability of the lower section is great, with little sign of the miles. 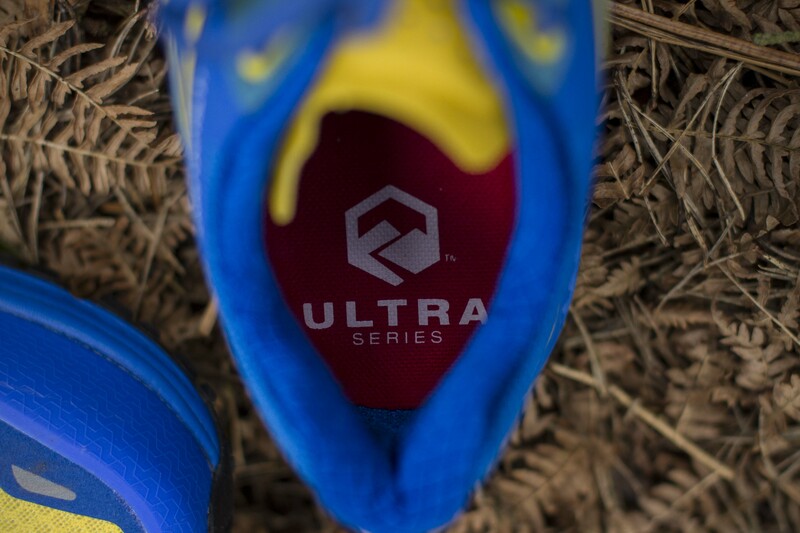 The Molded TPU toe rand is great, strong yet not getting in the way. It looks like it will take a fair few knocks and scrapes. At the back of the shoe, Ultra Protect™ CRADLE™ heel-stability technology keeps the heel and foot in check. The heel cup is supportive, holds well and the cushioning wraps around keeping movement minimal and the ride comfortable. In the collar, FlashDry is found to help get moisture out that bit quicker. Given how wet my general runs were, it was hard to test, however on dry days my socks weren’t as wet as they have been in the past. 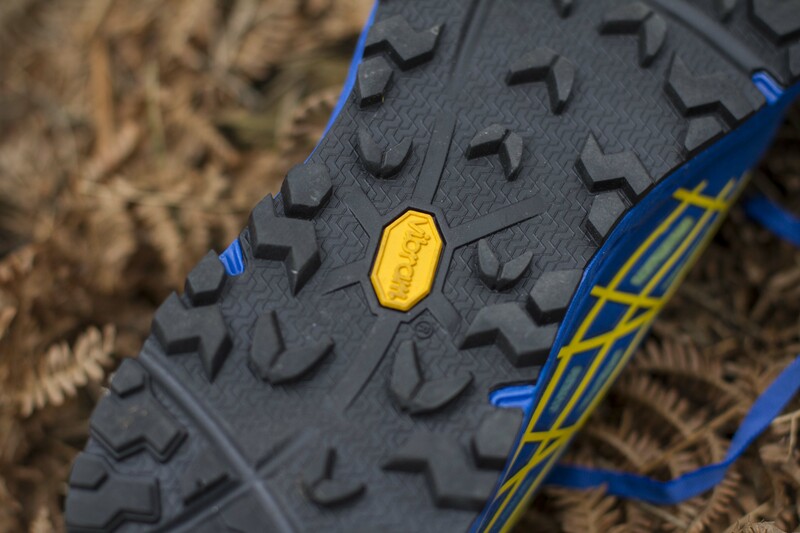 Up front the tongue is one of the best features of the Ultra Endurance, with a gusset to keep trail debris to a minimum. Having run on similar terrain in another pair of shoes on test without a gusset the day before, the effect of the feature is noticeable. If you want to keep everything out, invest in a pair of trail gaiters, but otherwise the tongue guesset does an exceptional job keeping the crud at bay. Given the likeliness of small stones and material entering, causing hot spots, this is a good move and one which does what it sets out to. Given the featured tongue, the laces work in unison and don’t compromise its benefits. The fit is secure without needing to pull every last mm of lace through the last eyelet, meaning those with shallower feet don’t have to worry about not fitting. Sizing wise, I had a UK 10 and these were as expected. I take a 9.5 in road shoes, but find up sizing works well for descending. Of course, don’t take my feet as a guide, try some on yourself! Covering the entire top section is a welded TPU upper with suede midfoot support overlays. The upper is soft enough for those longer runs, keeps the trail outside and has stood up well to all I have thrown at it. There are no build quality issues with the Ultra Endurance. To Add to this, the overlays help provide the upper structure for when you want to dial down that fit before taking on trail. So where do the Ultra Endurance sit with me? Overall, they are a strong shoe, build quality and aesthetics great, and the midsole will last for ultra distance events. However, my one grip is the sole. They claim it to be versatile, however, personally I would want to keep this for drier trails and certainly not go off trail unless I knew the terrain was hard packed. But don’t let that put you off, as always there are shoes for different terrain and I think I found the limitations of the Ultra Endurance and perhaps where the Ultra MT take over. I’ve since ran my local trails and enjoyed the cushioned ride. 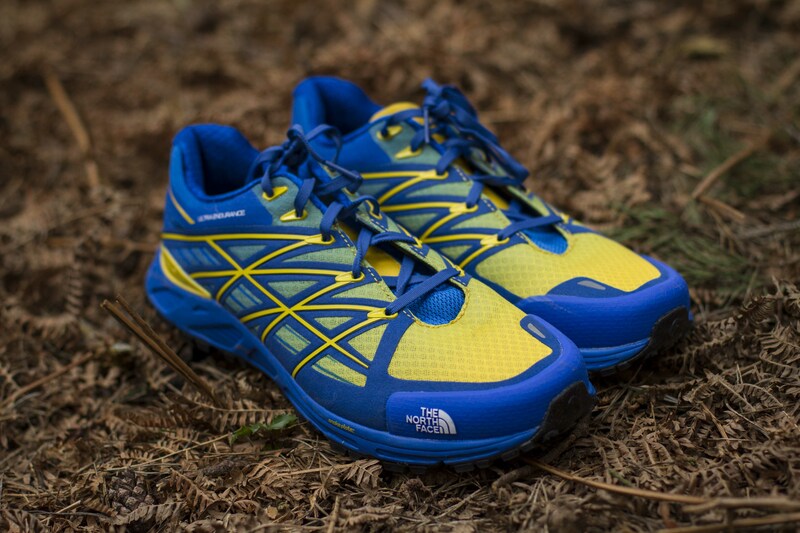 For the first North Face Trail shoe I have tested, I was impressed. If runners have held off trying the brand, I would say the Ultra Endurance has a strong case for long events provided the terrain doesn’t get too gnarly underfoot.